Robert Mueller has the authority to name Donald Trump an unindicted co-conspirator. He may be immune from prosecution, but there’s a strong public interest in knowing about the president’s actions. Special counsel Robert Mueller leaves after a closed meeting with members of the Senate Judiciary Committee June 21, 2017 at the Capitol in Washington, D.C. Imagine if special counsel Robert Mueller finds sufficient evidence to charge President Donald Trump, but his hands are tied because he or the Department of Justice concludes that they cannot indict a sitting president? Could Mueller instead identify President Trump by name as an “unindicted co-conspirator” when bringing charges against other individuals? The stakes are enormously high. Such action would have some of the same reverberations across the country as a criminal indictment of the president. A facile answer would rely simply on the fact that the special prosecutor in Watergate did just that. The Watergate grand jury named President Richard M. Nixon as an unindicted co-conspirator when it issued indictments of others. In the absence of some significant justification, federal prosecutors generally should not identify unindicted co-conspirators in conspiracy indictments. The practice of naming individuals as unindicted co-conspirators in an indictment charging a criminal conspiracy has been severely criticized in United States v. Briggs, 514 F.2d 794 (5th Cir. 1975). The rationale behind this rule is that it is generally unfair for the government to tag people with the marker of criminality without giving them an opportunity to defend themselves in court. These are no ordinary times, and the question here is whether the case of Donald Trump could provide a “significant justification” for naming him in the indictment, just as the Watergate grand jury did in the case of Nixon. The norm about not naming unindicted co-conspirators is sufficiently strong that one has to fully acknowledge the rationale and attendant difficulties. With that in mind, the case of the president is an occasion that could be narrowly cabined and where naming may be most appropriate. At bottom, this is an area controlled not by categorical rules. Instead, it involves different risks and factors that must be weighed at different stages of the criminal process. Before trial, for example, the attorneys’ manual recognizes that the prosecution may identify unindicted co-conspirators in a “bill of particulars” if requested by the defense. In that event, the manual says prosecutors should “generally” (read: not always) try to file such documents under seal, and should not appeal any court order directing them to file publicly. At trial, a specific exception to hearsay allows prosecutors to identify and enter statements by named unindicted co-conspirators. At these junctures before and during trial, the interests of defendants to know the details of the government’s case against them and the interest of the government to prove its case can outweigh an unindicted co-conspirator’s reputational interests in keeping her identity secret. The balance of equities also includes the press and the public’s interest in knowledge about the case. Federal courts, for example, have held that “the public interest in disclosure outweighs the privacy interests of the co-conspirators” in such instances. At least until 2013, the Justice Department’s antitrust division named unindicted co-conspirators in plea agreements and justified those actions as necessary to inform the public. The question then boils down to whether the balance of factors supports Mueller’s having this option at his disposal in this case. It does. Let’s see why. If there were ever a need to make an exception to the presumption against identifying an unindicted co-conspirator, Mueller’s investigation could be it. Simply put, a case in which two conditions exist—a person is immune from prosecution but there’s a strong public interest in knowing about their actions—can provide ample justification. Recall that the U.S. Attorneys’ Office Manual refers to a federal court decision, United States v. Briggs, having “severely criticized” the government’s identifying unindicted co-conspirators in that case. The Fifth Circuit judges who made that ruling, however, rested their opinion in significant part on the idea that the government had the option of simply indicting such individuals—and the failure to do so thus appeared unfair. The Briggs court said, “the indictment may make such additional persons defendants if there is probable cause to believe that they participated in the alleged conspiracy. We have been tendered no reason why in this case, if there was probable cause, the appellants were not included among those made defendants.” The Briggs holding was based on the fact that the government did not have a good reply—why couldn’t the government just indict the co-conspirators too? In Mueller’s case of naming the president, there are substantial, easily articulable functions and interests—the general one of the public’s right to know is at its maximum here and Congress is waiting to know what Mueller thinks about Trump’s involvement. Indeed, it would be mighty difficult to square Mueller’s assignment with the idea that he cannot say whether the president committed a crime. The provisions for the special counsel, for example, give Mueller jurisdiction to investigate obstruction of justice, and the public understanding is that he is, indeed, charged to investigate that matter and the matter of potential criminal wrongdoing in the Trump campaign no matter how high up it leads. In short, Mueller’s responsibility, best understood, includes determining whether Trump is guilty. And even the president’s own lawyers effectively acknowledged this fact, for example, in their efforts to clear the [resident by trying to set up an interview with Mueller. Having entrusted the special counsel with this solemn responsibility, it would make sense why Mueller should not have to wait for a defendant to request a bill of particulars or some opportunity like entering hearsay evidence if and when it finally comes to trial. At the very least it is safe to say that Mueller can clearly present a public interest that “rises to the dignity of a substantial interest,” far above what the court asked for in Briggs. The bill of particulars is, however, the statement of the prosecutor and does not carry the imprimatur of credibility that official grand jury action does. … When a witness testifies at trial he does so as a private individual and makes no formal adjudication regarding criminality. But we should not elevate form over substance. Any such differences should be acknowledged in the balance of factors. One could cogently argue that the public’s interest in knowing that a federal grand jury has amassed evidence of criminal conduct by the president outweighs any reputational risk that the president might suffer from the disclosure of his role. More broadly, we should not lose sight of how the balance of equities will shift in different cases. Recall that even a sitting president may be named in a bill of particulars before trial and as a co-conspirator or as part of other criminal activity at trial. In other words, the marginal benefit to the prosecution, to the defense, or the public’s right to know in such cases can override a sitting president’s interest in not being publicly named—even including cases in which there is already overwhelming evidence to find the defendant guilty and the defendant can likely tell the identity of the unnamed person. The point is that our legal system allows tradeoffs at each of these stages, and it is far easier to accept naming a sitting president in an indictment when there’s an enormous public interest in knowing. In addition to the factors we have worked through above, the president’s lawyers could argue that it is wrong to say he is completely immune from indictment. The Justice Department’s Office of Legal Counsel accepted in a 2000 opinion that the president at least loses immunity from indictment once he leaves office. So it may be said that one of the conditions that gives rise to the special reason for naming Trump here—that he can’t be indicted—is weaker. He is not fully immune. He just can’t be indicted now. At least that’s how this argument would go. But how much of a salve is it that prosecutors might have an option to indict Trump—but only after his presidency is over? If a president could be prosecuted only after leaving office (including the prospect of two four-year terms), that could significantly erode the prospect of an effective trial. In Clinton v. Jones, the Supreme Court held that a civil lawsuit against a sitting president could proceed while he was in office. The court recognized the significant impairment that can result from delaying a civil case against a president until after his term of office. Justice Stevens wrote for the court: “Such a lengthy and categorical stay takes no account whatever of the respondent’s interest in bringing the case to trial. … [D]elaying trial would increase the danger of prejudice resulting from the loss of evidence, including the inability of witnesses to recall specific facts, or the possible death of a party.” These concerns are amplified in criminal trials where the burden is on a prosecutor to establish guilt beyond a reasonable doubt. That said, perhaps Mueller’s hands are tied in that regard. The Office of Legal Counsel opinion in 2000 also counsels against an indictment of a sitting president that is then held in abeyance. So why wouldn’t the reasons for that conclusion dictate the same outcome (temporary immunity) for the question of naming a president as an unindicted co-conspirator? The Office of Legal Counsel opinion neither addresses nor excludes the option of naming a sitting president in a bill of particulars or at trial. And the scenarios for doing so far exceed cases of co-conspirators or hearsay rules. For example, imagine a bribery case against a sitting president that would implicate her when prosecuting the person making the bribe. The OLC opinion does not foreclose implicating the sitting president in that criminality. If we conclude that indictment of the President is constitutionally barred or is inappropriate, then we and the Grand Jury can and must fulfill our responsibilities to the public and to the law by recommending a Grand Jury presentment setting out in detail the most important evidence and the Grand Jury’s conclusions that the President has violated certain criminal statutes and would have been indicted were he not President. There appears to be no question of the propriety or legality of such a course. Finally, recall the federal court’s explanation that diplomatic immunity is one of the instances where prosecutors would have reason to name the person as an unindicted co-conspirator in an indictment. Like the OLC opinion on the president, diplomatic immunity can be temporary too. The Justice Department saw fit to name a foreign diplomat as an unindicted co-conspirator in a grand jury indictment within three years after Briggs. 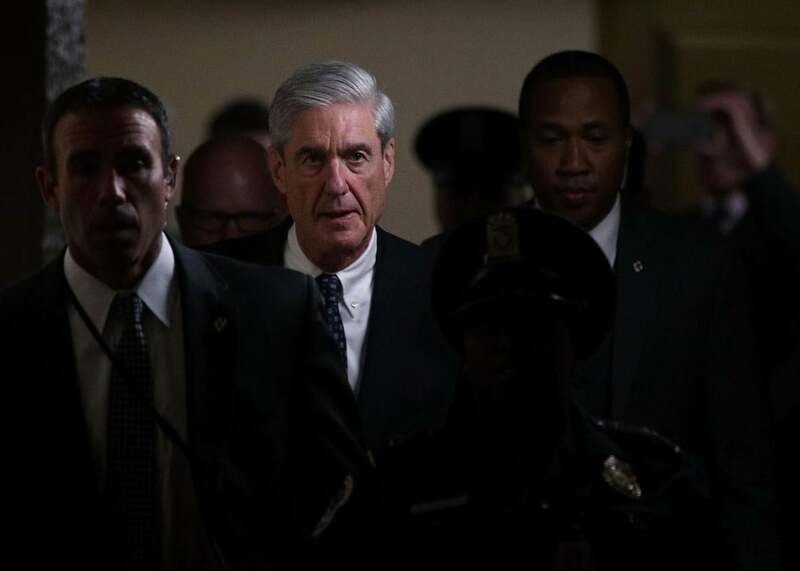 Having mined through the arguments on different sides of this issue, it seems clear that Mueller would have an open path to name President Trump in an indictment—for example as an unindicted co-conspirator—if there’s sufficient evidence of the president’s involvement in criminal activity within the jurisdiction of the special counsel. The Watergate special prosecutor’s legal team appeared to think there was not just an availability but a profound responsibility to name President Nixon as an unindicted co-conspirator if that’s where the evidence led them, and that may rightfully be Mueller’s lodestar.